Criterion Hotel Warwick offers comfortable hotel style Warwick accommodation with modern facilities. Discover the irresistible charm of yesteryear, genuine country style hospitality as you enjoy the old world surroundings. Experience serene rural landscapes when you spend the day visiting the wineries and slip quietly into the national parks for an eco-experience second to none. There’s everything from traditional pub rooms and en-suite luxury through to self-contained apartments. For those on a budget, there’s a selection of Traditional pub rooms situated along the hall. For a unique atmosphere, choose one of our Verandah Rooms with french doors opening out onto an enormous Victorian verandah located right on the main verandah front. Our traditional pub rooms and Verandah Rooms all have shared bathrooms, ceiling fans, wardrobes, soap, and towels. The Princess Suite and Apartment are our most luxurious rooms and offer free wifi, air-conditioning, televisions, fridges, tea and coffee facilities, soap and towels. The Princess Suite is 43 square meters in size and offers an ensuite and separate living area. The Apartment is 72 square meters in size, and the room highlights include a private bathroom, separate lounge, separate entrance and allocated carport space. Please note our accommodation is over two floors and there is no lift. The Criterion Hotel Warwick Restaurant is open Monday to Saturday serving traditional pub classics such as salt and pepper calamari, chicken schnitzel and sausages with gravy. Closed on Sundays and Public Holidays. Make the Criterion Hotel Warwick your base for exploring the magnificent historical & wine regions of Warwick and Stanthorpe regions. We look forward to welcoming you to the Criterion Hotel Warwick. 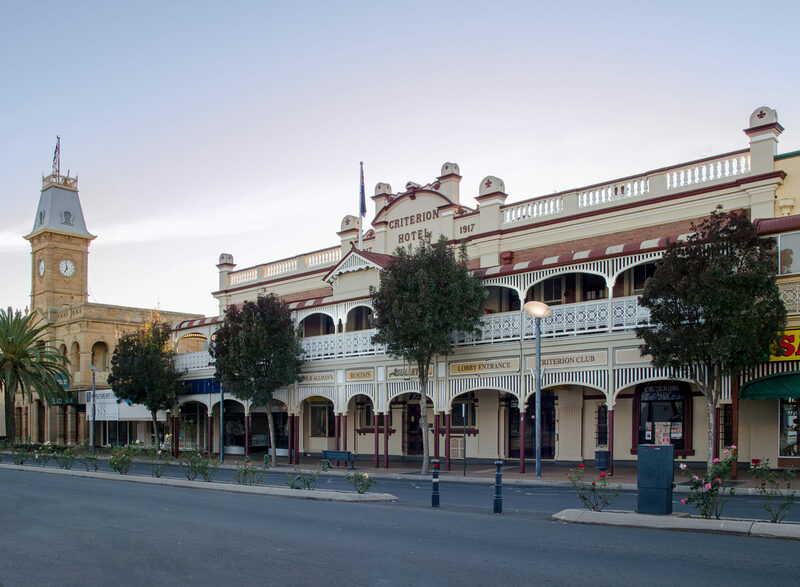 > The Criterion Hotel Warwick is situated in the heart of the great Rose & Rodeo City of Warwick. > Get outdoors on the Condamine River or Connolly Dam south-east of Warwick, or at nearby Leslie Dam for biting Yellowbelly, Silver Perch and Murray Cod. > 4WD on the Southern Downs – Sundown National Park is known as traprock country, named after the geology of the area. Sundown National Park features steep-sided gorges, steep gullies and razor-backed ridges. Two such distinctive natural attractions are Red Rock Gorge and Rats Castle. > Health and Wellness – For guests wanting to stay fit while travelling, there are facilities within a short distance from the Criterion including yoga, pilates, jogging, massage therapists, bushwalking and gym training. > Stop by the operating steam railway locomotive and plan your trip with one of the monthly runs from Warwick to Clifton or Wallangarra. Each Wednesday there’s excitement at the local pig and calf sales, while the month of July is reserved for the Jumpers and Jazz festival where live music fills the streets.